Dried blood analysis (also referred to as the Oxidative Stress Test (OST) is covered in detail in the live blood online training course. With dry blood analysis we are able to assess oxidative stress by looking at a number of anomalies. We are also able to see the extent of oxidative damage in the live blood samples. We look at the level of oxidative stress in the system by looking at clotting patterns in the dry blood samples. There is a very distinct difference between the layered dried blood sample of a healthy individual and that of a chronically ill patient. The healthy sample is a solid mat of pinkish-red dried blood with a strong, well-interconnected fibrin network. In the presence of degeneration, toxins and other imbalances, the dried blood sample shows white areas, called polymerized protein puddles (PPPs) as well as other abnormalities that can be indicative of certain systemic conditions. HOW DOES OXIDATIVE STRESS SHOW UP IN DRY BLOOD ANALYSIS? As the blood dries on the slide, there is a natural centrifugal activity whereby the different elements in the blood spin out into rings, depending on their specific gravity. Organs near the centre of the body create light PPPs that don’t spin out very far, whereas heavier PPPs are created by lymph and skin conditions that spin out around the outside of the layer. The size and shape of the PPPs is also suggestive of the nature of the condition. WHAT ARE THE MAIN CAUSES OF OXIDATIVE STRESS? Our cells can be compared to an apple that turns brown when exposed to air. Our cells can turn brown or “rust” when we breathe due to oxidative stress, this is a process caused by free radicals. Free radicals are unstable molecules that damage or “oxidize” cells throughout the body in a process called oxidative stress. Free radicals are unstable molecules that damage or “oxidize” cells throughout the body, this is the process called oxidative stress. Over time, oxidative stress can leave our cells and tissues unable to function properly. Some specialists claim that free radicals can have serious consequences for our health. Free radicals are believed to contribute to disease, hardened arteries and wrinkles, they are often associated with the health problems that we experience with age. Avoiding the causes of free radicals and adopting a lifestyle that helps fight back against them can help safeguard health by preventing oxidative stress. Excess calories, sugars and/or refined carbohydrates. Eating an excess of these foods cause our mitochondria to release more “exhaust,” as they burn fuel from food for energy. This creates higher levels of free radicals. Exercising too much or too little. Exercise is an important part of any healthy lifestyle, but too much can increase oxidative stress in our bodies. Excessive alcohol consumption. Drinking alcohol increases cytokines levels, these are inflammatory molecules that are linked to oxidative stress. Exposure to tobacco smoke. Tobacco smoke contains toxic chemicals that lead to oxidative stress. Exposure to air pollutants. Industry and pollution increase oxidation in our bodies. Excessive stress. Stress increases inflammation, which further increases free radical production. Ionizing radiation. Exposure to x-rays, radon, cell phones and air travel can contribute to oxidative stress. Charbroiled foods. Hydrocarbons found in these foods can contribute to oxidative stress. Fungal toxins. Environmental moulds (found in bathrooms and basements) and internal moulds and fungi related to the gut can produce toxins that increase oxidative stress. Poor liver and gut detoxification. The liver can become inflamed and produce more free radicals when it is overwhelmed with toxins from food or the environment, especially exposure to pesticides or mercury. Chronic infections. Hidden infections can contribute to oxidative stress. Lack of sleep. Sleep deprivation increases oxidation. HOW CAN OXIDATIVE STRESS BE PREVENTED? Preventing oxidative stress can begin by avoiding the causes of free radicals above. Improving breathing and oxygenation. This can help flush out toxins, free radicals and inflammatory molecules. Eating foods that reduce oxidation. Eating foods that contain antioxidants including a diet full of many different colourful fruits and vegetables that contain antioxidants. Ginkgo, Ginger, Green tea, Milk thistle, Grape seed extract, Rosemary, Turmeric. N-acetylcysteine. This can boost production of glutathione which is an important antioxidant and detoxifier. Alpha lipoic acid. This is an antioxidant that helps to improve energy production in the mitochondria. Coenzyme Q10 (CoQ10). Another antioxidant that is important for the mitochondria. NADH. This is important to the cycle of energy production in the mitochondria. By analysing a single drop of blood we are able to tell what you’ve been eating, drinking and doing! Naturopathic Microscopy is the only technique available to natural health practitioners that will allow you to view and assess the dynamic interplay between health and disease at the cellular level. By analysing the blood you will be able to identify various underlying imbalances, known to lead to disease, while still at an early stage – when they can still be corrected with simple natural protocols. You will automatically improve compliance in your practice: compliance to follow the recommended program and to follow up regularly to assess the progress. The history of live and dry blood analysis goes back more than 60 years and it is still developing today. Several independent researchers from across the world have spent hours behind their microscopes, analysing thousands of samples and making careful observations about the differences between healthy and unhealthy blood specimens, correlating their findings with clinical symptoms and conditions. What we have gained from all their hard work is a technique unparalleled in its accuracy and unmatched in its reliability. It has steadily grown in popularity among natural health practitioners worldwide by virtue of the insight it is able to provide on the body’s internal environment, which we refer to as the ‘terrain’. The analysis of both live and dry blood specimens provides us with valuable insight into the body’s internal terrain, which constitutes the blood, lymphatic fluid, cerebrospinal fluid and the interstitial fluid that surrounds every single cell in the body. Just like a fish swimming in unhealthy water will become unhealthy, so the cells in the body are poisoned by the toxins and acids in the fluid in which they are bathed. The purpose of looking at blood under the microscope is to determine the state of the terrain – whether it is in a state of balance or imbalance. https://livebloodonline.com/wp-content/uploads/2015/12/Logo-550x70.png 0 0 Elizabeth Clemons https://livebloodonline.com/wp-content/uploads/2015/12/Logo-550x70.png Elizabeth Clemons2018-08-10 11:02:492018-09-17 14:13:19Live Blood Analysis (Naturopathic Microscopy) – How does it work? We are on week 9 of the live blood analysis training course and now starting to study dry blood analysis which is also referred to as the Oxidative Stress Test (OST). In dry blood analysis, we leave 8 layers (spots) of blood to dry naturally on a slide, we then observe the anomalies seen. We are looking at anomalies that could be signs of allergies, adrenal stress, psychological stress and intestinal irritation as well as reproductive organ, bowel, vital organ, lymphatic and thyroid imbalances. Heavy metal toxicity appears as black points at the edge of the layer, or as a dark shore or waves. Strongly indicative of heavy metal toxicity, this can be from the environment (pollution, contaminated food, water or air, smoking and passive smoking) and also amalgams. Points at the edge of the layer usually indicate the presence of lead and/or amalgams. Dark waves deeper into the layer indicate that metals are being held in the fatty tissues, brain and nervous system, which is associated with an increased risk of Alzheimer’s, Parkinson’s, Multiple Sclerosis (MS). Click here for symptoms and recommendations. Thrombocytes are irregularly-shaped cells that do not have nuclei and are much smaller than red blood cells. They are typically 2-3 µm in diameter and have an average lifespan in the circulation of 8 to 12 days. They can be seen clearly in live blood analysis, darkfield microscopy. Thrombocytes are formed in the bone marrow where they bud off from megakaryocytes. Thrombocytes are probably the most important elements of haemostasis (the control of blood loss through blood clotting). The number of thrombocytes in circulation is a vital determining factor in a person’s tendency to thrombosis (clotting) or haemorrhage (bleeding). If the number is too low (thrombocytopenia), bleeding can occur, whereas an abnormally high number of thrombocytes (thrombocytosis) may lead to thrombosis (blood clots). Thrombocytes also release a variety of growth factors that play an important role in the healing of damaged tissue. Thrombocytes are an important part of the clotting mechanism. These tiny structures circulate through the body in an inactive state. When they are inactive they are disc shaped and repel each other, but when they become activated they assume a star-like shape and enmesh with each other (and fibrin) to form a clot. (Thrombocyte aggregation in live blood analysis). This week we are going through all the various growth forms described in Pleomorphism. There are 4 stages of development in Pleomorphism, with various growth forms found in each stage. Only the first stage is apathogenic, the other 3 are associated with some degree of imbalance and tendency to disease. It is important to recognise the various growth forms, whether they are really organisms or something else is not as important as the fact that they would not have been there if the terrain had been in balance. There is enough evidence to show that advanced pleomorphic growth forms only occur in advanced cases of acidosis so we can use the various pleomorphic forms as indicators of how severely out of balance the terrain is. And of course, seeing less advanced forms of development in subsequent visits indicates that the terrain is improving. Seeing bacteria in live blood is something of a controversial issue in LBA. Click here for some very interesting research conducted in Canada and published in the Journal of Clinical Microbiology proving that bacteria are in fact present in the blood. According to conventional medicine, bacteria will only be seen in the blood in septicaemia – so definitely not in clients who were able to come to see a LBA practitioner.. However, various types of bacteria are clearly visible in live blood of patients who are not suffering from septicemia and whose clinical situation correlates with the known imbalances associated with the presence of bacteria in blood samples. It is week 5 on the live blood analysis training course and this week we are looking at white blood cell (WBC) anomalies in live blood analysis. There are 5 different types of WBCs in live blood analysis and we are looking at all the anomalies that may be encountered under each type of white blood cell. White blood cell anomalies play an important role in live blood analysis, but you could say that red blood cell anomalies often determine the main focus of your assessment and treatment in a case. White blood cell anomalies in general relate to the state of the immune system in live blood analysis, possible infections, allergies and a few other conditions, such as autoimmune diseases. In many cases we simply take note of them, as they only confirm the rest of the results in the case. For example, if we see signs of toxicity and over-acidity in the blood, and we see signs of an underactive, stressed immune system, we won’t necessarily focus on the immune system, but rather on correcting the terrain. This is because the immune system possibly became compromised due to the imbalance in the terrain and using immune boosting supplements will produce disappointing results. This is because the underlying issue is an imbalance in the terrain – that is the primary disturbance so that is what should be the focus on to achieve good results. This is why live blood analysis is so valuable – the primary disturbance in a case can be addressed, instead of just dealing with the symptoms. So white blood cell anomalies serve to confirm the findings in the rest of the case and to add some context. There are some situations where a specific white blood cell anomaly would affect the results to such an extent that it could change the direction to choose in terms of treatment. For example, with a client who has sinusitis – in natural medicine we often focus on the digestive system and liver, as well as Candida, in sinusitis cases. However, there may be no significant signs of digestive, liver and Candida problems seen in such a case, but many signs of allergies (a white blood cell anomaly) you would then need to focus on treating the allergies specifically. Another example would be a case where many signs of toxicity (poikilocytes) are seen along with signs of an acute infection. In such a case it is most likely that the toxicity resulted from the infection and doing a detox wouldn’t be the correct approach – supporting the immune systems and clearing the infection would be much more important. So it is extremely important to be able to connect the dots in a case and to understand how the anomalies observed relate to each other. Otherwise there will be a lot of information but no understanding of what is going on in a case and it would be difficult to know what corrective measures to put in place. Complementary Medical Association Membership in all categories is available internationally – so wherever you live in the world, you can benefit of the advantages of CMA Membership in all categories. The CMA is an amazing organisation – doing invaluable work for our Members and we need your support. Whether you are a fully qualified, professional complementary medical practitioner, student, training course provider or you work within the profession in a company offering the very highest standards of products and services, you really should Join The CMA today! The Complementary Medical Association has a great deal to offer ethical companies and organisations who wish to work in partnership with us. The Complementary Medical Association is highly selective about the companies that we work with and will only offer CMA Approved Supplier Membership to those companies that we wholeheartedly believe to offer the very best products and services. If you are a professionally qualified, top complementary medical and Natural Healthcare practitioner we would welcome YOUR support in helping us to represent You and Your Therapy’s successes to a wider audience. As well as fighting off attacks on our profession – from whatever source – we also seek to actively and publicly promote the positive, successful face of Complementary Medicine and Natural Healthcare – as practiced by some of the top professional practitioners in the world. Be a CMA Registered Training College – and get the recognition and rewards you deserve for your Professionalism and Teaching Qualifications. And Help The Complementary Medical Association Stand Up for the Right of your graduates to Practice Successfully. 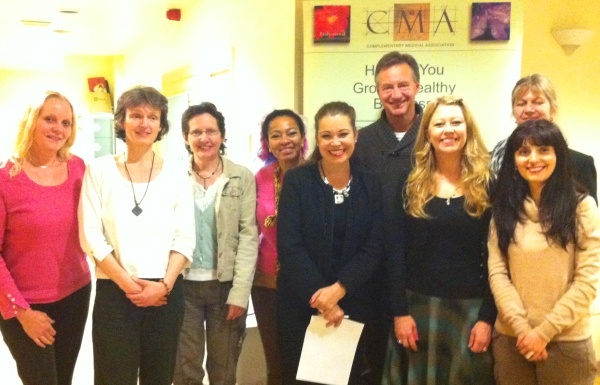 Become a Member of The Complementary Medical Association TODAY. You’ll receive a whole host of unique member benefits and you’ll help support the incredible work of The CMA. We’d love to welcome you as a valued Member! Is there a treatment for Lyme disease? Lyme disease is seen in live blood analysis and conventional medicine as spirochetes (white spirally twisted bacterium) under high magnification with a darkfield microscope. Dr. Bill Rawls whose life and a busy medical career were disrupted midstream by fibromyalgia, later diagnosed as Lyme disease, recovered his health completely with a natural treatment for Lyme disease. He says “There is much confusion surrounding Lyme disease. Dr Bill Rawls late 40s were marked by debilitating fatigue, tremendous brain fog, aching all over, burning in his feet and tingling in the hands, skin rashes, joint pain, chest pain, heart palpitations, mood changes, and poor sleep. “I know what it’s like to start and end every day feeling like you have a terrible flu”, he says. He goes on to explain that over several years, he experienced virtually every known symptom of Lyme disease. Lyme disease is mainly transmitted by ticks, which are about the size of a pinhead. The ticks bite and transmit the microbe. The tick then drops off so most people aren’t even aware that they have been bitten. Symptoms of the initial infection are very mild, if they occur at all so people can easily be completely unaware of being infected. If the immune system function is active and strong, a person can go indefinitely without ever having symptoms. They will not know they are harbouring these types of microbes. If and when illness does occur it can be chronic and debilitating. The degree of illness is very variable with some people being very severely debilitated, while others are only suffer mild illness. “When I was first diagnosed with Lyme disease, my first response was to try antibiotics. But every time I started a new round, I would be absolutely miserable by the second week”. After realizing that oral antibiotics weren’t a solution for me, my faith in the medical system diminished. My medical colleagues didn’t seem to understand Lyme disease or have much interest in treating it. Other than prescriptions medications for treating symptoms, they had little to offer. “As I came to know the microbe better, I began to understand why antibiotics are not necessarily a good treatment for chronic Lyme disease. Though some people do overcome Lyme disease with antibiotics, it doesn’t occur consistently enough to be considered reliable. Dr Rawls created a list of all potential solutions and prioritized according to cost, potential for toxicity, and evidence of benefit. Things that were very costly or carried a high potential for harm were kept at the bottom of the list. Natural herbal therapy was definitely on his list; He had a longstanding interest in herbal therapy. But his medical background made him sceptical. How could anything natural and non-toxic actually cure Lyme disease? It was about that time that he came across Stephen Buhner’s book, Healing Lyme. https://buhnerhealinglyme.com/ In Healing Lyme, “Buhner provided a better explanation of Lyme disease than any I had read. He also presented compelling evidence for treating Lyme disease using herbs with antimicrobial properties (used with or without antibiotics). His approach was logical and based on sound scientific evidence”. Dr Rawls was intrigued. Simple, nontoxic, cost-effective natural treatment for Lyme disease and delivered to the doorstep. Why not give it a try? “The more I studied, the more it became apparent that herbal therapy was a perfect fit for suppressing the stealthy microbes associated with chronic Lyme disease. More than anything else, chronic Lyme disease is a breakdown of the body’s ability to fight off everyday threats and heal itself. It isn’t as much the microbes themselves as it is that the microbes are no longer constrained by a strong immune system. For me, years of rigorous night call, eating on the run, and other bad health habits weakened my immune system enough to allow the microbes to flourish. Creating a healing environment within my body was essential for my recovery. Though herbs were essential for my recovery, I recognized that I also had to curb the habits that contributed to my immune dysfunction in the first place. Poor eating habits and antibiotics had made a mess out of my intestinal tract. I also knew that I needed to make some drastic changes to my diet. Admittedly, it was a challenge at first—I grew up in middle of the fast-food generation. But with time, eating healthy became the new norm. With a cleaner diet, all the digestive issues cleared, including leaky gut. We are pleased to announce that the Advanced Live Blood Analysis Online Training Course 2018 will begin on May 9th for 6 weeks. The training course consists of 6 one hour weekly lessons and is $599 USD. The advanced course is for live blood analysis practitioners who have completed a live blood analysis training course that covers live and dry blood analysis, who are looking for more clinical insights into the technique, and for those who want to stay up to date with the latest information in this developing field. To better understand how to proceed from analysis to choosing a protocol/treatment. To simplify managing complex cases. Insights into the assessment and management of complex chronic conditions, with examples from clinical practice. Detailed case examples of clients from practice who were successfully treated with naturopathic and nutritional interventions, based on protocols developed by assessing their live & dry blood samples. Naturopathic insights into the cause and management of autoimmune conditions. Review and discussion on dry blood analysis and the mechanisms behind dry blood anomalies. Review and discussion on cancer indicators with two case studies. What plays the most vital role in determining your success with LBA in practice? What is the most important piece of information you need to achieve great results in practice? What specific protocols are required in the treatment of chronic cases. What the most important piece of information is that’s required to achieve great results in practice. How to correlate the information in the case at the end of the analysis to choose the correct approach in treatment. This course is suitable for live blood analysis practitioners who have completed the Neogenesis Systems & Live Blood Online training course, or a similar live blood analysis training course that covers the analysis of live blood in brightfield & darkfield, and the analysis of dried layered blood. If your training course didn’t cover these aspects of live blood analysis in detail it’s advisable that you first complete the 12-week online course to obtain the foundation required to fully benefit from the information in the live blood analysis advanced training course or email us to see if the course would be suitable for you. To find out if you’ll be able to enrol for the advanced course, please send us an email with the details of your previous live blood analysis training course, including the course outline or syllabus. In week 1 of the live blood analysis training course we are learning how to get a perfect blood sample every time. Consistency is very important in live blood analysis for best results. We are also learning how to use the microscope and switch between dark field and bright field. We are learning a lot about live blood analysis (LBA), especially how valuable and helpful it is as part of a preventative approach. During the war, the “Red Ball Blood Test” was used as a quick test on the battle lines. If a soldier claimed to be sick, they pierced his finger with a needle for a drop of blood. If a “red ball” appeared, the soldier would be handed his rifle and sent off to battle. If the blood layer on the finger looked watery and not bright red, the solder was deemed ill, and would usually not be sent off to fight. This test could quickly determine an individual’s overall health. On the live blood analysis training course we learn how to use a lancet on the finger to get a good blood sample. Many people assume that in live blood analysis blood is taken from the vein as in a medical blood test. This is not so, a simple prick of the finger using a lancet is all that is needed for a live blood analysis sample, this makes it ideal for children and animals (where a sample is taken from the ear). It is important to take the sample correctly to get consistent results, an incorrect sample will not give a clear analysis. The blood sample must not be exposed to the air for long and must not be pressurized in any way, as in squeezing the finger for example. The dry blood analysis sample must be taken by using the weight of the slide on the finger, different pressures would skew the results so it is important to learn to use this procedure correctly. Once the live blood analysis procedure has been learned we then watched a video on how to use the microscope and view the blood samples. We learned where exactly to concentrate on the sample and which areas to avoid to get a true picture of the blood. Next week we start looking at blood and its components as well as some common anomalies and how to recognize them, their appearance, relevance, implications, associated symptoms, the medical perspective and pleomorphic perspective. We then study the interventions and further investigations if any. This is all in the 500+ page manual and the online training site for further study and much more can be gleaned from the Live Blood Analysis Training Course private Facebook page where past and present attendees post their findings and ask questions. Join on this fascinating journey!. You don’t need a microscope to join. We offer a 2 part payment plan. We provide all the help and back-up needed. You receive 2 wall charts and a 500+ page manual. You get recordings of all the lessons to review at your leisure! This is THE most comprehensive training course in live blood analysis. “I thought the first module of the training was excellent and am looking forward to the next session. Elizabeth and Dr Okker have been wonderful to deal with. I shopped around looking at systems and was so impressed with the quality of information they offered when making the initial enquiry. They have been so helpful throughout the entire purchasing process. The added advantage of being able to study through Live Blood Online was also helpful cutting down on the need to travel overseas to study. Being able to purchase a system and then be taught by the doctor who put the system together makes it feel complete and gives me as a practitioner beginning LBA some confidence and certainty. Please contact us if you have any questions, would like to enrol or if you would like to know more about choosing the right microscope for you and avoiding any costly mistakes.